New Regulation on Credit Reporting Agencies...will it Protect Americans? We have seen this coming and written about it several times. Millions of Americans have lost their credit rating, as a result many companies that sell homes, cars, consumer goods, are losing money. Their customers no longer qualify to finance a home or for a credit card at Home Depot, Ford, GM, or Toyota. That means lower sales. The credit scoring system has been a secretive, "self regulating" system, but it is so uniform and programmed that it eliminates important factors. Such as the character, or assets, or longevity of consumers. Consumers have long complained about the unfair and harmful way the American credit reporting system functions. Ask you local bank President, and most of them can't even explain the details of how it works. Yet, it controls, loan decisions as they system now works. It is time for reform. Thus it is no wonder that these credit scoring companies will be subjected to supervision by the Consumer Financial Protection Bureau, as announced this week. The main players in this are Equifax, Experian and Trans Union. There are also about 27 other smaller credit scoring companies. 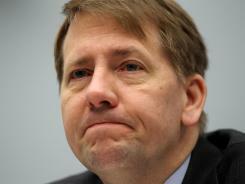 Richard Cordray, is the the government agency's director. We can only hope that the system will become more transparent, and put in new standards that give an estimated 100,000,000 Americans an opportunity to participate in the U.S. economy and rebuild their "credit" without the traditional "7 year" penalty term. It is time that business leaders realize that the current system is hindering a solid recovery in the American economy. When the system was evolving, a melt down of banking and financial markets such as the one we have experienced...the worst in 40 years, was not factored into the system. So, an inordinate number of Americans simply are locked out of the American economy. So how will the CFPB work? 1. Spot examinations2. Review of credit bureau reports to the government3. Require faster response to public complaints and requests for "reviews" of their creditsituation, and correction of bad reporting. And hopefully, new recommendations to U.S. lawmakers on how a more relevant and responsive credit reporting system can be designed. Pamela Banks, ofConsumers Union, says that this gives the American public "Somebody on their side." Industry sources said that the industry is already regulated by the Federal Trade Commission. That sleepy oldbureaucratic agency, has long been understaffed, over worked and is not considered a leader in progressive ideas. It certainly has not made headlines in it's success in enforcing the Fair Credit Reporting Act. At least there are some bright "politically correct" public statements. Experian put out a report saying that they wanted to be "helping consumers get access to fair and affordable credit. "OK, the American people say. With the Missouri challenge. "Show me". The credit bureaus must, by law, respond when a consumer reports that they have incorrectly downgraded him or her. But as the system has grown to enormous size, many of the credit reporting companies, simply run their computer file and review the facts that they already have. So, they come up with the same answer, and do not effectively respond to consumer complaints. Many bankers believe that the intent of the law is a true, review, to check and gain more facts, to give Americans and consumers, every chance to clarify and improve their credit. We can all hope that this new regulatory effort will show "teeth" and make positive changes in the industry. The industry keeps confidential and detailed financial information on over 200,000,000 Americans. They have the power to impact whether people can get credit, or what their interest rate will be on the loans they have. They can force people into bankruptcy by highly disruptive and negative credit reporting. Many companies, including Federal Government agencies, require a person to have a good credit score to get a job. Some companies, such as insurance companies, check credit scores to determine whether they will insure, or at what rate. The record, as it now stands, shows thousands and thousands of Americans, complaining that the credit reporting agencies simply do not correct inaccurate information, that causes U.S. consumers harm. Not to mention, the damage and drag it puts on the American economy.